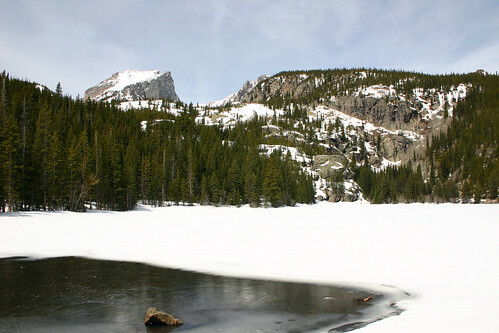 Bear Lake was almost completely frozen and covered with snow. Only the part at the bottom of this photo was free of ice and snow. The mountain to the left is Hallett Peak with Flattop Mountain to the right. This entry was posted on May 5, 2008 at 9:21 pm and filed under Bear Lake, Colorado, Estes Park, ice, lake, mountain, National Park, Rocky Mountain, Rocky Mountain National Park, snow, trail, vacation, water.